Gastroesophageal reflux disease or GERD is affecting millions of people all over the world (mostly in developed countries) which is an almost incurable condition, and thus the world-wide medical attention is justified. But why are people of developed nations more prone to suffer from GERD? The reasons are not too difficult to sort out. They gorge themselves with spicy, fatty food which the deprived can ill afford and are thus saved from this agonizing ailment (GERD has been associated with such foods). But before delving deeper into GERD medications , it may be prudent to suggest that changing lifestyle and taking a holistic approach to the disease may form one of the most significant steps towards addressing the problem. GERD medications may come in the form of prescription drugs, non-prescription drugs, home therapy, essential oil therapy, herbal and mineral therapy, honey therapy, apple cider vinegar therapy and many more. However, the goal of all these therapies is the same - to relieve the symptoms (heartburn, chest pain, persisting sour taste in the mouth), prevent complications and to heal esophageal abrasions, in case any such injury has occurred due to incessant acid reflux. Sometimes life-long GERD medications are needed for people suffering from severe heartburn that has gone chronic or are caused due to genetic factors. The essential nature of all prescription as well as non-prescription medications is to control and/ or neutralize excessive stomach acid (Hydrochloric acid) by way of allowing the patient to swallow anti acid forming drugs, failing which H2 blockers are used to reduce the formation of the acid. Since non-prescription H2 blockers are usually lower in strength, one may opt for prescription H2 blocker which is of course much higher in strength. When these also fail to effect any relief and the matter becomes complicated with an inflamed esophagus , Proton pump inhibitors are used to provide the much needed relief. 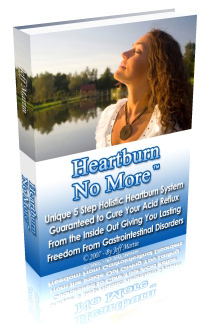 Since heartburn is primarily caused by the weak lower esophageal sphincter or the LES that allows the acid reflux into the esophagus, another form of GERD medication attempts to strengthen the power of the LES so that it may close more firmly so that acid reflux is immediately arrested. Clinically known as Prokinetic agents, they are often combined with acid reducers to obtain instant relief but are likely to cause severe side effects. As for common home remedies, active Manuka honey from New Zealand is often used to relive heartburn. A soft mixture of the honey with a glass of distilled water and romaine lettuce is said to have the desired effect fast. Also good is a mixture of natural honey, licorice and aloe vera juice since it soothes the esophagus lining for many hours. There is also the apple cider vinegar that is mixed with a glass of water and taken before the meal or whenever heartburn is likely to occur. GERD medications work best when the treatment is holistic in nature. As opposed to conventional remedies that just try to address the symptoms, holistic remedies treat the body as a whole. This is just the right approach for GERD because the contributing factors of GERD are many and the disease can be quite complicated too.